Enjoy the convenience of a traditional toolbox in the storage area with a dual-compartment dog box in the basket area with Owens Products' Crossover Style Two-Dog Box. 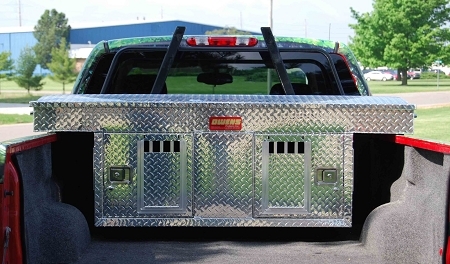 The locking stainless steel slam-latch doors feature vents with removable covers, safety latches and slots for battery-operated fans to keep your hunting partner comfortably cool on warm days. Standard vents on the side deliver refreshing airflow for additional cooling. Dog compartments are lined with blue corrugated plastic, which aids in keeping them cool in the summer and toasty warm during the winter. Super-strong Owens exlusive toolbox-style Ellipse lid with automotive bulb-style gasket ensures toolbox contents remain clean and dry. Secure-close top storage compartment with rotary push-button latches. Rugged .063 diamond-plated aluminum construction. Made in USA. 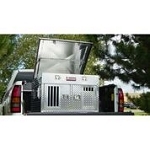 Overall: 71.625"L x 61.25"W x 25"H.
Dog compartment: 17.5"H x 24"W x 25"D.
Storage area: 4.5"H x 61.375"W x 24.25"D.